Black Friday is known for deep discounts on big ticket items like computers and HDTVs as well as major home appliances. If you're considering buying a Black Friday laptop or appliance, make sure you know what restocking fees retailers charge in case your Black Friday deal turns out to be a dud. Restocking fees are often targeted toward items consumers might buy, use for a few days, and then return. This means that laptops, cameras, GPS systems and other portable electronics often carry a restocking fee when returned after being opened. Many retailers will also place restocking fees on appliances like ovens, dishwashers, refrigerators as well as washers and dryers. Why is it so important to know about restocking fees on Black Friday deals? Because retailers are often trying to one-up each other with deals so viciously that they may be tempted to cut corners and bring in a lower quality appliances or laptops than normal. On the pages of a Black Friday ad and in line at 3 a.m., the Black Friday deal may look identical to the higher end model, but when you get home and unbox it, there's a chance you'll notice missing features you don't want to live without. If you need to return your Black Friday laptop or appliance, you may get hit with a high restocking fee that could rival all of your other Black Friday savings. Not a happy way to start your holiday shopping season. Here are the restocking fees for some of the most Popular Black Friday electronics and appliance retailers. Click on the store name to see each retailers' full return policy. Keep in mind that when it comes to technology items, you may only have 14 days to make a return, even with a receipt. 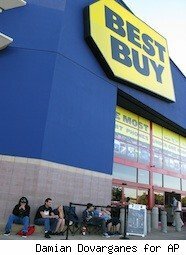 Best Buy -- 15% on opened electronics. Amazon -- 15% on opened computers. Target -- 15% on camcorders, digital cameras, portable DVD players and portable electronics. Office Depot --15% if box is missing anything on technology products, including computers. Office Max -- 15% on opened technology. Sears -- 15% on home electronics returned without the original box, used, and without all packaging and accessories. Apple -- 10% on opened hardware or accessories. Dell -- 15% on non-defective hardware returns, including computers. Home Depot -- 15% on special or custom orders only. How can you avoid paying restocking fees on Black Friday deals? The easiest way is to do your research before you go out looking for a Black Friday appliance or laptop. Even with the best research you may end up with an item you want to return, so it's good news if you can avoid the restocking fee by not opening your item right away. Restocking fees almost always only apply to opened items, so try leaving it in the package for a few days while pondering your purchase and reading reviews.